Northern Hardwood Company is a second generation company that has been furnishing, installing and refurbishing wood, synthetic and vinyl gym flooring; wood, synthetic and vinyl sports flooring; fitness room flooring, hardwood basketball courts, and hardwood basketball courts for 50 years. Since our inception, we have installed several million square feet of sports flooring throughout the Western United States. We focus on installing high-quality gyms, indoor tracks and other athletic surfaces for schools, churches, recreation centers, private clubs and residences. Northern Hardwood Company, located in the greater Seattle area serves Washington, Oregon, Montana and Idaho. Contact us today for a free sports flooring estimate. Let us help with your future projects! Northern Hardwood has developed a long standing partnership with the sports surfacing industry leader, Connor® Sports Flooring Corporation. Connor Sports Flooring is the leading manufacturer of maple hardwood courts and synthetic sports flooring in the United States. 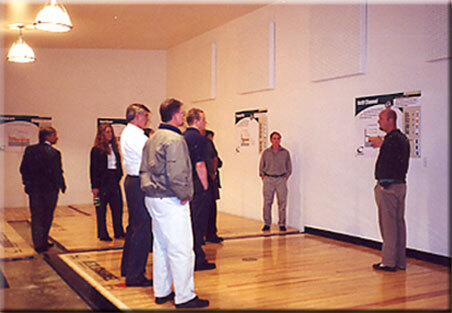 Connor Sports Flooring has designed and built more than 75,000 game courts in the United States and abroad. Connor Sports Flooring was the first company to develop athletic flooring that's recycled and recyclable, it's called GreenPlay. GreenPlay delivers significant value by using subfloor panels made from recycled engineered polymer. The unique construction of the floor and subfloor allow GreenPlay to qualify for substantial LEED credits, making it the choice of architects and contractors designing for green applications. Connor Sports Flooring is also proud to be the only ZeroWaste company in the sports flooring industry. Recycling, avoiding waste, innovative technology and a strong environmental consciousness are a major part of our corporate policy. As a ZeroWaste company, less than 1% of all our waste is sent to a landfill. Connor Sports Flooring is the official surface of the NCAA® Final Four™ and the NCAA Men's Collegiate and Women's Division I volleyball championships and USA Volleyball National Team and Events. Our partnerships also include the National Basketball Association (NBA); Federation of International Basketball Associations (FIBA); the International Badminton Federation (IBF). Northern Hardwood has provided floors for and built relationships with several major universities, professional teams and nationally recognized organizations. Some of our relationships include: Washington State University, University of Washington, Eastern Washington University, Central Washington University Gonzaga University, University of Idaho, Boise State University, University of Montana, Montana State University, Montana Tech University, Carroll College, University of Oregon, Portland Trail Blazers, Multnomah Athletic Club, LA Fitness, The Church of The Latter Day Saints and The Nike Corporation just to name a few. To help clients and decision makers select the gym flooring surface that is best suited for their needs, we have built a Design and Performance Center at our facility in Deer Park, Washington. In the Design Center you will learn about and experience the different levels of safety and performance that may be achieved and the respective dollar values for each system you are interested in. Click here to schedule an appointment at our sports flooring design center.